Let’s be honest, the Brexit process is a mess. This isn’t a political point, just a statement of fact. After all, when the man who’s been negotiating the deal quits because he cannot support it, you know things are not exactly tickety-boo. 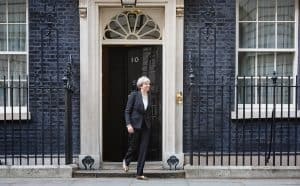 Theresa May – Soon to be leaving Number 10 for the last time, or staying the course? Add in the fact that Dominic Raab’s predecessor went the same way, other ministers are quitting as I write and the governing party and opposition each has more splits than a convention for Pan’s People tribute acts, and the situation is far from rosy. As an exercise in PR, it’s about as grim as it gets. News reports, of course, focus on this doom and gloom. We are told almost on a daily basis that industry cannot plan for the future, that thousands of jobs are at risk and that business is being paralysed because of political uncertainty. As ever, the news reports fail to provide a full picture. Just this week, the subject of Brexit was raised at the Shropshire Business Leaders’ breakfast in Shrewsbury. You might have expected a fiery debate with lots of eye-rolling, teeth-gnashing and general wailing and howling from our local titans of industry. In fact, what we got was a clear-eyed, unanimous and largely optimistic picture. Whatever the Brexit deal – or lack of it – leaders agreed that there would still be a need for investment in housing, in the vital skills our industry needs to succeed, in the infrastructure which supports a thriving economy and in our children’s education. Businesses could, and must, continue to plan for all this – and much more – regardless of the current shenanigans in the corridors of Westminster, they agreed. And around the county, hugely-important and fabulous work to make all our lives better will continue whatever the final outcome of the negotiations. The redevelopment of the former Ironbridge Power Station, restoration of the Flaxmill in Shrewsbury, huge infrastructure projects in all corners of the county and a push to give Shropshire a modern broadband network fit for years to come, were all cited as examples of long-term schemes which will help bring new prosperity to our region. So, as the great political drama unfolds over the next few days and weeks – and one thing I can guarantee is that there is a lot, lot more to come – remember this: There is still plenty of certainty even in this uncertain world. And there are plenty of people around the county planning for how best to meet the many opportunities which undoubtedly lie ahead.